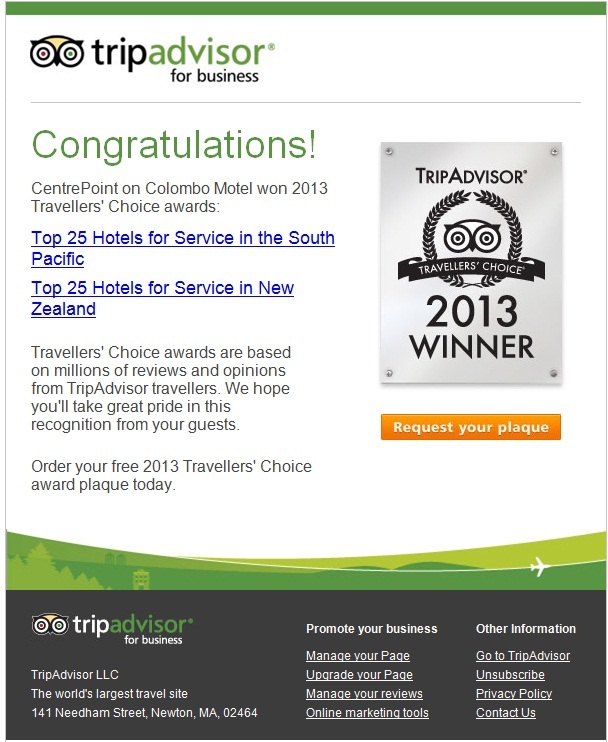 TripAdvisor Travelers' Choice Award - 3 in a row!! Wow, 3 in a row! 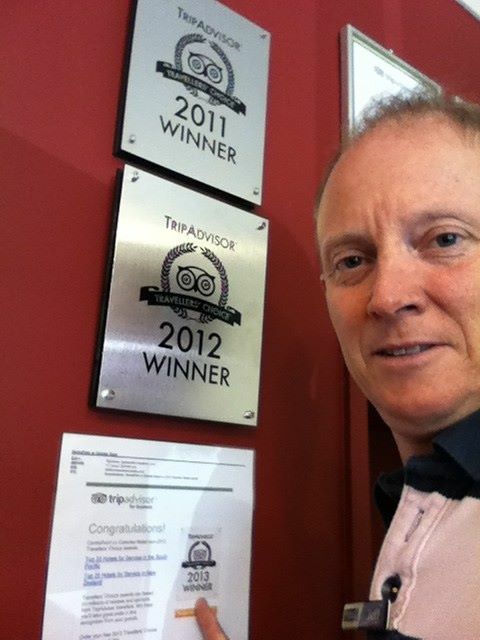 We blogged about our first Trip Advisor Travellers’ Choice Award in 2011 and blogged about the second award last year too. We’re super proud to say we’ve done it again this year in the awards announced recently! Yes, Best Service Awards 3 years in a row. This year we are No. 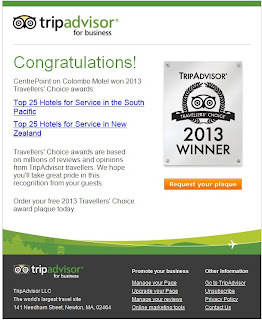 8 on the list of Top 25 Hotels for Service in New Zealand and No. 15 on the list of Top 25 Hotels for Service in the South Pacific. This follows a top 10 finish in 2011 and another award in 2012. This is the 11th year of the awards and the first year that NZ has had its own category. The first 2 awards we received were in the South Pacific Category but this year we are No. 8 in NZ!! Great to see that these awards are developing as they reward hard work and are judged by untold numbers of real guests! In another sign that the Awards are evolving, there is a good variety of winners spread throughout NZ this year. In fact, apart from The George Hotel (winner in Top 25 Hotels in NZ category), this year we are the only Christchurch Hotel to feature in the awards as opposed to 4 motels last year. So, if you are looking for great service in Christchurch, stay at a great motel which has been judged by the guests themselves. Stay at a motel that has won in the Best Service category 3 years in a row. Stay at CentrePoint on Colombo Motel! We’re once again elated and humbled but before we give ourselves a well deserved pat on the back, we’ll say thanks to all those guests who took the time to review us on Trip Advisor! As for us, well it might just be a nice bottle of wine with dinner this evening while continuing to provide more great service to our wonderful guests!